Sophie lived in the town of Market Chipping, which was in Ingary, a land in which anything could happen, and often did - especially when the Witch of the Waste got her dander up. Which was often. As her younger sisters set out to seek their fortunes, Sophie stayed in her father's hat shop. Which proved most unadventurous, until the Witch of the Waste came in to buy a bonnet, but was not pleased. Which is why she turned Sophie into an old lady. Which was spiteful witchery. So I’m late the party here… It seems like everyone else has read this book, every time I mentioned it I’d get that look. The “Seriously? You haven’t read it?” look. I just barely saw the Miyazaki movie based on the book a couple years ago. 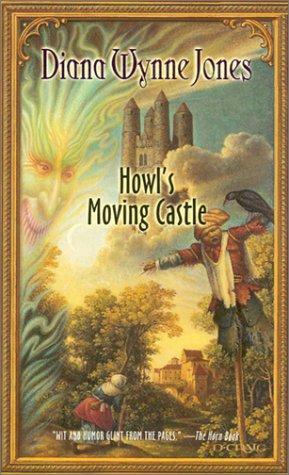 My audible credits started stacking up again and as I was trying to pick out a book, Howl’s Moving Castle popped up as a suggestion. It had great ratings so I decided to give it a try. I really enjoyed it. The story has great humor, and the characters are fantastic. The world building is great, so many details. Sophie is delightful. Absolutely stubborn and doesn’t bend to anyone’s will. She constantly doubts her own abilities, only to have her own opinion of herself proved wrong by making a tricky move, outsmarting someone. If you’ve seen the movie, then you know how the first half of the book goes. They’re almost identical. Halfway through however, they split off into completely different directions. Both are good though. This is one of the rare times when I can say that I like the book just as much as the movie, INCLUDING the changes. It drags a bit in the middle, but for the most part it clips right along and keeps you pulled into the story with all the adventures Sophie has. If you’re looking for a traditional fantasy novel, this is definitely a good one. The audio is excellent, I really enjoyed listening to it. I adore that book! Both the movie and the book are great in their own right :). I'm so glad you enjoyed it! Like you I enjoyed the book just as much as the movie despite the different endings. I just read this book and loved it too. Never seen the movie though, that sounds interesting! Sophie is a great character, I can't believe how she just gets on with stuff, no matter how strange! I was late to read this book, too. I watched the movie just last year and so I had to read the book. And I agree with you about loving both versions! Both are wonderful in their own way. I actually just downloaded a copy of this a month or two ago, and I can't wait to read it. I've seen the film, but not read it yet, so I can't wait! Great review! I think I'd love to see one someday actually discussing the differences and exactly WHY they both work! In a way, I felt the book rushed their romance - keep in mind I read this awhile ago so I don't remember too much - but it was like they barely spent any scenes together and suddenly they loved each other in the end. I'm probably going to do a review that talks more about the changes and why both were good! It'll be on my personal blog, The Bookish Thespian. I've had this on my shelf forever but still haven't read it. I haven't seen the movie either. I feel like a horrible fantasy fan! But your review has encouraged me to go dig it out and read it soon!